Five Years Ago: Hectic What? Where were you five years ago? I was heading down to Bay Ridge to record with my producer friend Peter Litvin. From that came a load of finished songs that were the backbone of my 'Hello World' 2013 Album. Peter had a film and video room mate guy (let's call him 'Greg' cause that's his name) who roomed on his couch. They used to amuse themselves by making weird short videos. Out of one of their small video acorns ascended the character 'Hectic Knife'. They looped me in as a character too and I got to enjoy 'acting the gom' as the Hectic Knife character and Hectic's roomie 'Link'. I got in a few funny lines. Here's a few pictures from along the way. 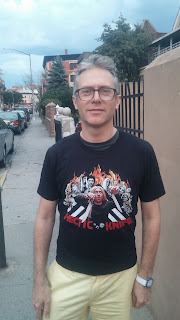 I might add a few more as I get them but do get yourself a viewing of Hectic Knife and a t shirt! Opening musical act for the "Sundays @ Seven" Comedy Night at the Irish Arts Center. Feature Set with Ray Parker on Bass and Genna Johnson on backup vocals. Niall Connolly is our genial host & may be a special surprise announcement event at this show.